Have too many to do’s to fit on a weekly planner? The Daily Simplified Planner may be just the tool you need to simplify and manage your busy life. It is one of the best daily planners in my Ultimate Planner Comparison, see if and how it can change your life too. I have always been obsessed with planners. I’ve had many different brands and each one suited the season of life I was in at the time. But as life changes, what I need from my planner changes also. 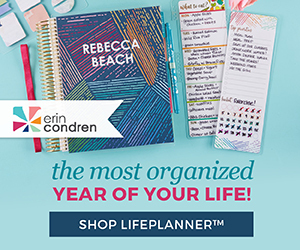 I’ve tried my share of different brands and I love helping others find the perfect planner to help them through their current season of life. So earlier this year, I did an Ultimate Planner Comparison of the 11 best pretty and functional planners on the market today. Today, I’m doing an in depth Daily Simplified Planner review so that you can see its features, how I used it so you can determine if it will work for your lifestyle. From my PowerSheets Prep Work that I did at the start of the year, I pinpointed what I wanted, and moreso NEEDED, this year was to simplify my life. Last year, I was guilty of trying to do all the things and half finishing a lot but not completing anything. So I made my word of the year SIMPLIFY and wanted to take action steps to simplify 4 areas of my life (finances, faith, home and blog). I had heard wonderful things about the Simplified Planner* and so I bought two, one for the Ultimate Planner Comparison Giveaway and one for me to keep, test out and bring you an honest Simplified Planner Review. Be sure to visit me on my momssmallvictories and productivemomsplan accounts on Instagram for more pictures of the Simplified Planner in use. First, I thought I would walk you through my Daily Simplified Planner* in pictures. I have the watercolor floral academic year 2018-2019 Daily Simplified Planner (coil-bound), doesn’t the cover just make you happy? Want to know what I’m using? Don’t worry, specific pens and products I used along with the Simplified Planner are mentioned at the bottom of this post. If you’re like me, you want to know all about the pens and accessories as much as you do the planner! The Simplified Planner is a beautiful, joyful agenda for busy women in all seasons of life. Designed minimally on purpose, its open pages serve as a fresh start every day. We believe margin matters, and our mission is to inspire women to organize, simplify, and carve white space for the good stuff of life. The daily edition covers 12 months (with one day per page and shared weekend pages) and features a gold wire-o binding, a navy inside liner and pocket, 4 notes pages in the front, and luxurious Mohawk Via paper. 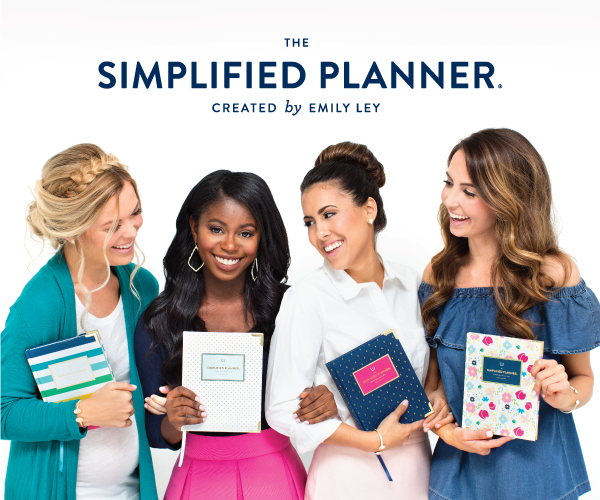 With your Simplified Planner purchase, you’ll also receive monthly coaching (with videos!) from Emily, via email. Please note that below described my 2018-2019 planner which is no longer available for sale. The 2019-2020’s have just launched and it is my understanding they are the same in format but please do check Emily Ley’s website* for most recent updates. Ok here we go! This bright, little beauty made me happy from the moment I opened the fuschia box. I noticed the elegant brushstrokes in the watercolor flowers, the little Emily Ley hidden pineapple icons and the sparkle of gold foil accents in the flowers and lettering. I am a sucker for flowers so I loved this cover. With gold reinforced corners and a gold wire-O binding, this is a sturdy planner that has stood up well over the last month of use. There are 6 covers to choose from in the daily if you like something more stripey, dotty or pineapply (is that a word)? Bottom line, the covers are all lovely and they seem to be well made. I’m interested to see how the goil foil on the cover and wire binding hold up after the year is through. The Daily Simplified Planner* cover is the most colorful part of the planner, the interior layout pages have simple, clean lines with little pops of color to help the day and date stand out. The inside front cover of the Daily Simplified Planner* has a navy blue pocket to keep stickers, paperwork or a slim notebook. The title page has space for you to write your name and information. I kept a few sticker sheets and a slim traveler’s notebook in my front pocket so I could keep project notes, master lists and trackers since the planner does not have any note pages in the back. There is a letter from creator Emily Ley following the title page. Like the Powersheets, there are some helpful Prep Work pages that creator Emily Ley walks us through to help us simplify our lives, easy steps and things to ask yourself so you can figure out how to”choose what matters” when deciding what projects to take on or how your time is spent. There are a couple pages of year at a glance calendars for 2018 and 2019 and a list of holidays for 2018 and 2019. The Looking Back and Looking Ahead pages help you analyze what worked and didn’t work in your last year so that you can develop new routines and healthy habits this year. The weekly and daily routines pages help you develop a routine that makes sense in your current season of life. I rely on the routine I’ve figured out to make sure that all the roles I’m juggling get tended to. When my routine changes, I can feel out of sorts until I figure out a new one. My weekly routines include home tasks like laundry and cleaning, days I have to take kids to soccer practice, the fun things we’ve carved into our week (like family movie night Fridays and church, dinner out and at-home date night Saturdays), and what days I cook versus eating leftovers. I’ve done great figuring out my home and family routine, but I need to also incorporate my blog routine to make sure it all gets done. Simplifying blogging is one of my goals for this year and it might be the hardest because of all that has to be done to run a profitable and successful blog. Next we have the 30-day Simplicity Challenge which is a list of 30 tasks that are supposed to take 15 minutes or less and will help you simplify and declutter the unessential. Easy tasks we know we should do but forget about doing. I love a good checklist to help me stay focused so this one serves as a quick win action plan, you’ll feel like a load has been lifted when you get these done. The Yearly Bucket List is your fun page to dream big and get those biggest adventures and goals out of your head and onto paper. The Monthly Calendars has a few lines for notes to add any that you wish. Calendar week starts on Sunday. The design again is simple, clean with a little color on the month’s title. My favorite feature on this calendar is the Simplicity Tip at the top of the page, they match some of the items on the Simplicity Challenge prep work to remind you to do them! Monthly tabs add another pop of color and are laminated so they won’t get damaged. On the left side of the page in the picture above, you can see the weekday page layout. The day, date and “my day”, “to do” and “notes” are in color but all other text is in black. Dates of U.S. Holidays are in red font so they stand out. The header space can be used for a reminder or gratitude about the day. There is space for your hourly schedule from 6am to 9pm, equal space for a long to do list and a section at the bottom for notes so you can write in whatever you like. I like the freedom and flexibility of this notes space. It’s large enough that I can use it for my health and water tracking, meals and some journaling about my day. The page size is 7″x9″ so it’s smaller than the Purposeful Planner (daily format) and Passion Planner (weekly format) that I was using earlier this year. I have large handwriting so I have to abbreviate my to dos but I am able to get everything onto a page. The right side of the page in the picture above shows the weekend pages, where Saturday and Sunday share a day. The “my day” section does not have hourly time slots like on the weekday pages. In the Sunday header space, there is a prompt and room to write a favorite memory of the week. In the Sunday to do list space, there are 4 preprinted “weekly prep” tasks so that you simplify your week ahead and it runs smoother. I like that having those tasks already printed on the page makes sure that I do them and get a balance between tending my family, home and my self care. Since the colors were already laid out for me, I use the same Powersheets colors for tracking my goals and how I spend my time in my planners. I got Papermate Flairs* and the colors matched the Powersheets categories perfectly. So here is how I color code my tasks in the to-do section so I can ensure that I get a good balance of work, home, family and self care needs. Emily Ley has a Simplified Planner color coding scheme on her free printables library that coordinates with the colors in the planner, her Pilot Precise pen set* (the pens shown in my pictures above) and her color coding*, icon stickers*and flag stickers*. That’s the color scheme I will be using in my planner for 2019 since I just bought all those stickers! It simplifies the amount of color categories I have from 8 to 6 (and holidays won’t be used much) so see I’m simplifying already! Small victory! The picture above also shows you how I track how my time is spent. I started tracking my time several years ago to help me see where my time wasters were and get a realistic idea of how long tasks take me to do (I’m a chronic underestimator of how long things take me). I’m a stay at home mom and so inevitably, at the end of an exhausting day of mom life, I’d look at my goals or look around the house and think I didn’t get enough done. So I started tracking my time to help me see just what I did all day (there are so many little things that come up right?) and it helped me focus on my accomplishments instead of the unchecked items on my to do list. By focusing on my accomplishments, it gets me super motivated to get things done. So here is what I was doing this year to track time…I keep appointments and must do’s with a deadline in my Google Calendar that I share with my family. I look at the Google Calendar the night before and again in the morning to make sure I know what’s coming for the day. I have reminder alerts set to my phone an hour in advance so I make sure I have time to finish what I’m doing, get ready and commute to the appointment. I only write the appointment in my planner when it’s done. Because of my health, sometimes optional appointments will get canceled. Because of weather, my sons’ soccer practice might get canceled. I don’t like crossing things out in my planner and since it reflects how my time was spent, I only write it in when it’s completed. I like to track my time in quarterly increments which worked well in the Purposeful Planner and Passion Planner because they had two lines dedicated per hour. Since the Simplified Planner only has one line, it doesn’t have as much room for quarterly time tracking so I have to be more general on what I put in the schedule section. However, the limited space in the Daily Simplified Planner* is forcing me to simplify yet again and make me rethink my time tracking system and how I can adapt it to meet my current needs and goals. The daily pages end on August 1, 2019 (I have a 2018-2019 planner) and since this planner is already 1.25″ thick, there were no additional notes pages. I kept a slim notebook in the front pocket and bullet journal my master task lists and to do’s into it. I love the paper in this notebook*, it’s thick and smooth. But for the new 2019-2020 planners, there are 4 notes pages in the front! Still I think I’d need an extra notebook for all my epic lists and now Emily Ley makes mini notebooks* that match the planner covers, I ordered one to review for you! This little notebook really is a brain dump of all the ideas and miscellaneous to dos I think of. It helps having it all in one place so I don’t forget something. The main question I get is what are the differences between the Simplified Planner* and Day Designer Planners, so I though I’d give you a quick recap here to help you decide which is best for you. This is based on my experience with the daily planners I purchased (Simplified Planner in 2018-2019 and the flagship size Day Designer in 2016-2017. You can see pictures inside and check out my full Day Designer review here. I did an ultimate pen test and tried to figure out the best pens to use in the Simplified Planner. The photos will be uploaded later in a separate post but I did want to give you the results of my pen test here. The paper quality in my 2018-2019 Simplified Planner* was 70 lb Mohawk Paper (105 gsm) and is the same in the 2019-2020 planners according to their website. I think the paper quality is comparable so my pen test should be accurate. I tested the following 9 brands of pens to figure out what the BEST pen to use in the Simplified Planner is. There are a combination of Emily Ley’s brand pens, gel pens and felt tip pens and one brand of highlighters. I love the colors in the Papermate Inkjoys* and the metal tip makes these pens glide when you write. The color is vibrant and inky so if you want a bold look this would be a good choice. I can feel the colored dots left an indentation of the paper on the other side of the page and colors shadow on the other side of the paper but do not bleed completely through. If you don’t mind shadowing (and I don’t), then the ink joys have a great color selection and are easy to find on Amazon or Target. The Emily Ley Pilot Precise v5 pen set is my favorite here. I love the extra fine point and there are enough colors to have a variety without an overwhelming selection. These are fantastic for writing, color coding and outlining doodles but I wouldn’t use these to color. These are the ones that I am currently using daily. I’m pleasantly surprised at how much I like the Emily Ley Gold dot pen*. I’m typically not a fan of rollerball pens but this one writes smoothly and is a bit heavier and wider than the other pens I tested so it’s actually easier for me to write with. And can we just say, I just love the box it comes in with the magnetic closure. It would be a perfect gift for the pen lover or teacher in your life! The pastel neon pack shadowed the least of the 3 packs I tested but that gold/orange highlighter matches the gold in the Simplified Planner perfectly! But I just gotta love the bolder colors and love the fine tips so you can actually write notes or color doodles you want to highlight in your day. * The Simplified Planner* (Daily Watercolor Floral). The 2019-2020 planners are out now! This cover is no longer available but the new ones are gorgeous too! * Snap planner icon stickers* – similar to these because I bought mine years ago! there are a few more I didn’t name but there’s a lot to help you simplify various areas of your home, school, work and life! Truth be told, when I first started using this planner, I thought it was too small to be able to track all my random ideas throughout the day. I was coming from larger planners where I had more space to write, time block and track how my time was spent in quarterly increments. But what I realized the more I used the Daily Simplified Planner* was that it forced me to abbreviate and you guessed it, SIMPLIFY my planning process and routine. As it turns out, it does have enough room to keep up with my daily needs and the little notebook can keep track of any overflow that doesn’t get done or for longer-term projects. Realistically, there is enough to do space for what I could possibly accomplish in one day. I love the Daily Simplified Planner for the ways it’s helping my simplify my life. I love the Prep work like the Simplicity Challenge for 30 ways to simplify my home, mind and mom life. Some easy things I haven’t thought of doing, some quick wins, and some things I procrastinate with and just need to do. I love the Looking Back and Looking Ahead pages as I think it’s important to see what worked, what didn’t and what you want to improve on. This is the sort of exercise I like to do weekly as well as part of my planning routine. I love the clean lines and pops of color in the Daily Simplified Planner. I love the large notes space where I can track and journal what I want when I want. This planner is small enough that you could carry it around in your purse or work bag but it might be a little heavy. I like that the weekend pages have a space for a favorite memory of the week. But I do wish that Saturday and Sunday had a dedicated page and I have mixed feelings about the preprinted Weekly Prep tasks since I tend to meal plan and grocery shop on Monday or Friday. I’d rather have that space available to write what I need. This is a great life planner that works in conjunction with a goal planner like Powersheets but if you need something that will help you identify and track progress towards your goals, then this is not it. There is not much in terms of goalsetting, unless your goal is to simplify and then the Daily Simplified Planner* is a great start! Bottom Line: I highly recommend the Daily Simplified Planner* by Emily Ley. It i is a simple, clean and colorful planner that helps me simplify my busy life, home and mind. By color coding my tasks and tracking my time, this pretty little powerhouse is an effective time management tool to help me focus on my goals and get more done so I can have more fun! The more I use it the more I love it! 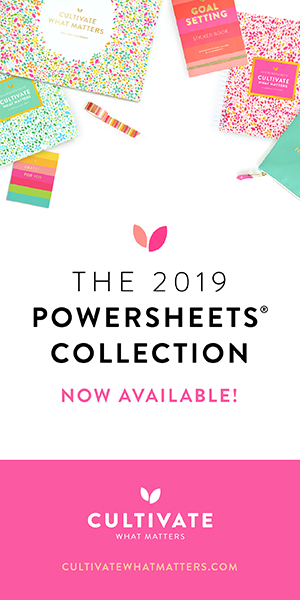 If you want to see how the Simplified Planner stacks up against other planners on the market, be sure to check out my Ultimate Planner Comparison post and download a free chart to help you decide. It’s called the Ultimate Productivity Bundle*and it was created and curated by people with real life responsibilities just like you: they have families, work part- to full-time jobs or run businesses, don’t have personal assistants or the budget for hiring lots of extra help. They want to help you (and themselves) conquer your to-do list, free up more time for yourself, and reach your goals. Check out the entire Ultimate Productivity Bundle* . At only $49.97 for over $1,500 worth of resources, It’s an incredible deal for everything you get! Wow! This looks like the ultimate planner! Very thorough. And it’s beautiful. Hi I’m looking for hints and tips on putting together my very 1st planner.so my husband and I can get our finances and life together.where it should be.and on track.